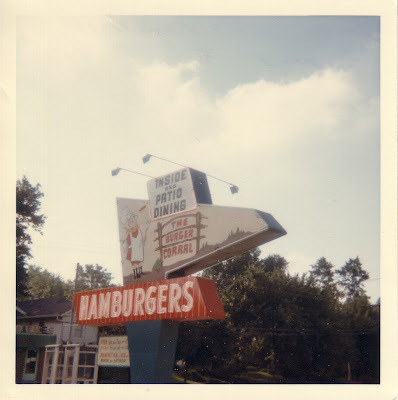 Funky Foto Flashback: Mmmm, Burgers…. I’ve always thought it was so cool that my dad worked at The Burger Corral in St. Louis to put himself through school. He took this picture sometime in the 60’s. When I was a waitress at Pizza Hut, trying to make money for college, I often complained about my job. Dad would tell me about being a manager at The Burger Corral. He knew where I was coming from. He knew how hard it is to work at a job when you have cranky customers, and you really just need the job for the money. About a year ago, our church had a guest pastor. He worked at The Burger Corral with my dad, and as he preached, he included a story about their days flipping burgers together. My dad had been the pastor at our church for many years, so the members of the congregation got a kick out that story! It was fun for me to hear about those days from someone else who had worked with my dad, before he was a dad! ← Tweet, Tweets, Tweeting, Twitted? ?